Hot springs and gravel roads? Sounds like an ideal spot for a weekend bike, camp and soak. 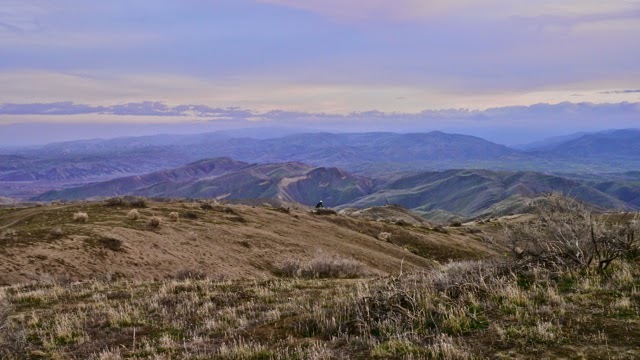 Remote and off-the-track, the Panoche Hills are located on the western fringes of the San Joaquin Valley. You can disperse camp in Panoche, but if you have 40 bucks to spare, you can camp under tamarisk trees at Mercy Hot Springs, which is just down the road. 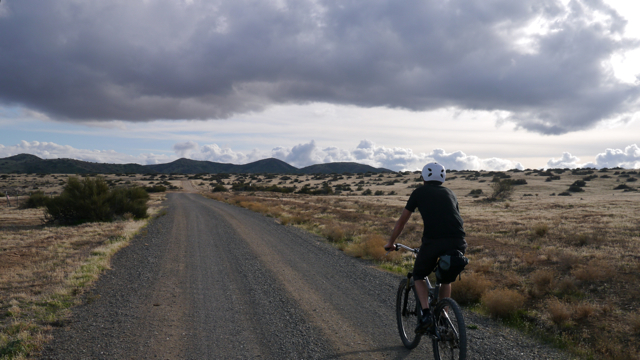 For mountain bikers, an unpaved but well-maintained access road winds up into stunning views of the surrounding area. After a 3 hour drive from Oakland, we unloaded the mountain bikes and mercifully headed for the hills. Panoche thoroughly embodies the free-for-all character of BLM land. It is a public shooting range and pasture for sheep and cattle. Its Cretaceous shales are treasure grounds for fossil hunters. 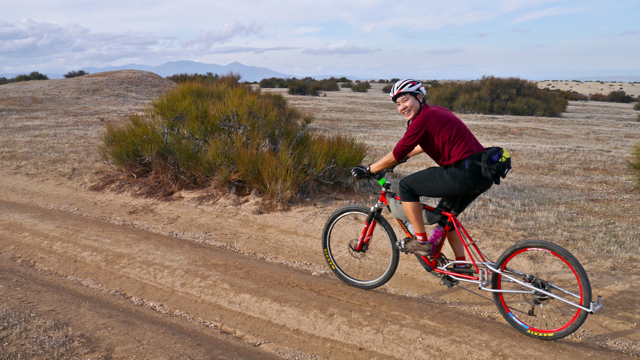 As we huffed our bikes up the steep, gravel grades, we passed only three other bikes — a pair of mountain bikers and a yellow beach cruiser, which was strapped to a minivan. 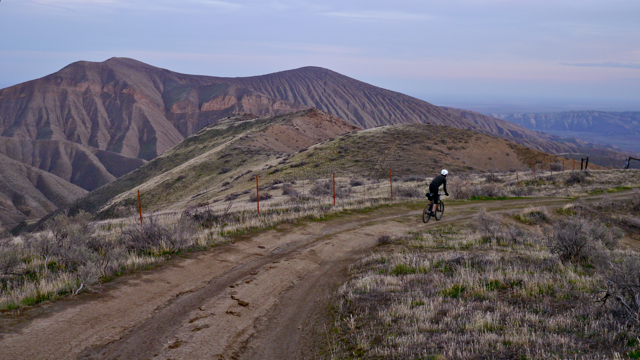 My reward for pedaling – then pushing, then cursing – my bike to the top was a breathtaking vista of Panoche Valley. The Inner Coast Range rose like feudal battlements above scattered cattle ranches in the long and dusty valley. Sunset turned the hills gold and then gray. We descended into a night dark valley starred with lonely porch lights. Back in camp, we slid into the hot, sulphury tubs at Mercy Hot Springs and soaked under full moon’s light. The next day, we dropped into the local watering hole, the Panoche Inn. It’s a motorcycle bar with a huge dog chained out front and dollar bills stuck to the ceiling. On a Sunday afternoon, locals in cowboy hats shared talk about a good-looking local gal — the only blonde in the valley — who was present and sporting motorcross duds. They speculated about the huge rainstorm coming this week and the flooding that would follow. They didn’t mention the handpainted signs down the road proclaiming: “Stop Solargen! Save Panoche Valley!” Thousands of acres of overgrazed ranch lands have been bought up piecemeal by some of the nation’s largest energy companies. Plans and permits are underway to build the largest solar farm in the nation. The plan includes 12,000 acres set aside as “mitigation land,” a bureaucratic horse-trade to circumvent (or liberate) the Endangered Species Act. By setting aside this acreage, companies will be permitted to bulldoze known habitat for endangered species like the San Joaquin kit fox. At the bar, a brochure on the counter suggests you buy the place for $650,000. Panoche is boundary land, left to us from the settling of the desert West. It is a stunning and fragmentary inheritance. Have a look now before the view turns into a parking lot for solar panels. I’ll be sure to return and see if it was worth it. At lower elevations, the dry hills are dotted with shrubs of desert tea, bringing a Basin and Range feel to the place. Longtail mountain bike for scale. A dense stand of yuccas as we wound into higher elevations. 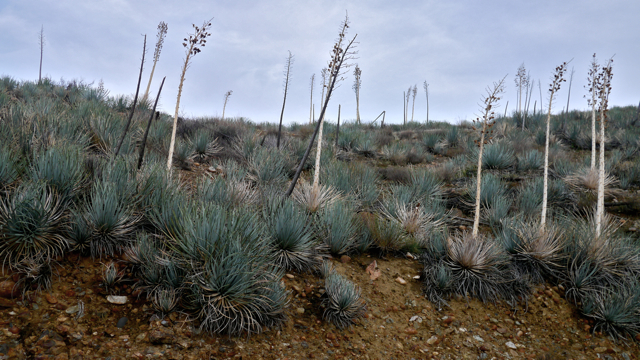 These were smaller statured and more blue-green that I associate with Hesperoyucca whipplei (Our Lord’s Candle) – an effect of the poor soils or incorrect identification? Looking south into the Tumey hills. Sunrise over the Panoche hills – best viewed from a hot tub. Truck camp spot under tamarisks. Look east of Exit 379 on Highway 5. There lies the Panoche Hills, criss-crossed by a steep network of ranch roads (BLM map here). 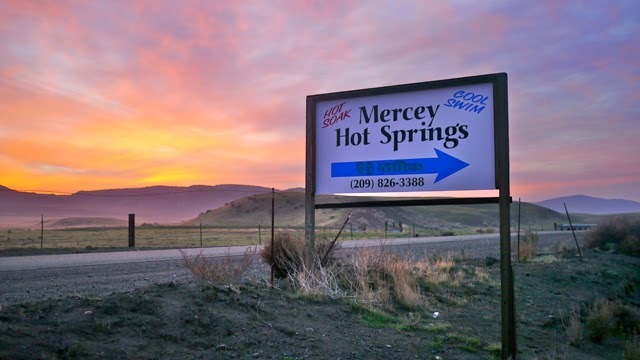 The main access road starts by Mercy Hot Springs, which has limited camping spots by reservation. $40 per person gets you overnight stay and 24 hour access to the salty and sulphury hot tubs. You can also disperse camp in the BLM lands for free – choose your spot wisely and out of range of the guys target shooting pistols and semi-automatics. Beyond the Hundredth Meridian: John Wesley Powell and the Second Opening of the West, by Wallace Stegner. After the Grizzly: Endangered Species and the Politics of Place in California, by Peter Alagona. Chuckwalla Land: The Riddle of California’s Desert, by David Rains Wallace. Side Trips from Interstate 5: Panoche and Tumey Hills. Andrew Alden, QUEST Northern California. Finding a Home for Big Solar, Part One and Part Two. Craig Miller, QUEST Northern California. Nation’s largest public utility joins Panoche solar venture. Morgan Hill Times, July 18, 2012. The Panoche Hills are the soft and eroded remains of a hilltop giantess. She reclines with the California Aquaduct as her necklace — angular and chunky, set in concrete and water wealth. Her head is buried beneath the San Joaquin Valley and crowned by endless orchard rows, glimmering with oranges and pears. Her belly we call Panoche Valley and this we will armor with solar panels, a glistening breastplate of power. Ginger is a human-powered adventurer based in Oakland, California. This work is licensed under a Creative Commons Attribution-NonCommercial-NoDerivatives 4.0 International License. Please credit Ginger Jui and link to The Flaming Bike Blog for all quotes, links and re-shares.